Cut the crusts off the bread, and butter the slices. Top 4 slices of bread with the cucumber and a squeeze of lemon. 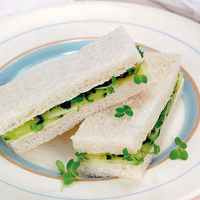 Scatter with cress and mint leaves, then top with the remaining slices of bread, buttered-side down. Cut each sandwich into 3 fingers and serve immediately.